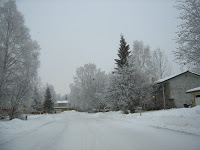 While winter is definitely here, we in Anchorage at Camai Bed and Breakfast have taken the time to enjoy the beauty of the hoar frost on the tress and the sunrises followed all too soon by the sunsets. Yesterday as I was leaving home I first heard all the ravens. Then I saw them in the trees. 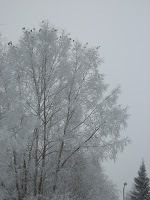 They looked like ornaments sitting on the top branches of the trees which were laden with hoar frost. I went back and got my camera to capture what I saw leaving Camai B&B. In today’s Anchorage Daily News there was a georgous Anchorage winter scene. The Anchorage Daily News has more winter photos on line. Follow the link, scroll down, click on Frost and Fog on the left side of the page. Alaskan winters have their beauty.